Stress or Tilt? We like to use the terms interchangeably. Recently I read The Mental Game of Poker, and he coined the word Accumulated Tilt, when referring to a streak of tilt that builds up in a player and affects his decisions. Recently, for me, I’ve decided to never use the word tilt when referring to ongoing emotional or mental problems. Tilt is what happens immediately after a loss or some other negative poker instance. Stress is what happens as the result of tilt. I like this more because then I can look at all the factors contributing to the stress and not consider it a poker-only condition. The last year is different for me than the previous five. The main difference is I’m now relying on poker for most of my income. While I did this for a long period before 2011, I had gotten comfortable with knowing I’d have a paycheck every month and the poker I played was merely extra income. Did I mention I broke my hand slamming it into the back of my chair? Financially, I was ready to play for a living. I had more money than I could possibly lose in a short amount of time, I could even go for years without profiting if it came to that. Emotionally, I was far from ready. Even though I had prepared for the worst, I truly expected the best. I expected to start playing for a living and make double what I was making at my job. When the first 6 months didn’t turn out that way, I had built up a large amount of stress. Second guessing my playing ability, second guessing my decision to play full-time, second guessing my goals in life. These kinds of stresses are not really tilt, it wasn’t because I felt I was on a losing streak. In a way, I had set myself up. Books. Forums. Other Poker Players. This is an easy one. Easy to do, but hard to make yourself do it. Simply focusing your brain on studying poker is good way to relax it from the tilt that comes with not doing as well as expected. We’ve all heard this though. As poker players, we know we are supposed to study to get better. Why don’t we do it more often? The reason of course is the same thing we are trying to fix: stress. So first, it is best to deal at least a little with that beast. I should have known when I was sitting in the hospital waiting to get my hand bandaged that I needed to rethink things, but instead I was busy cursing myself and my general luck. 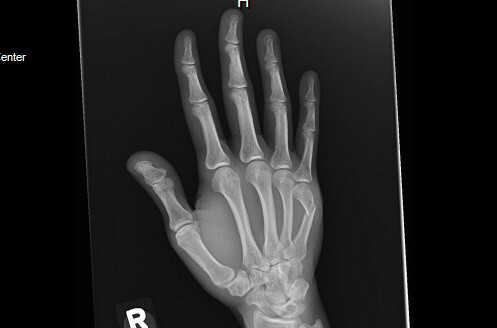 If only I had been able to have a good session, I obviously wouldn’t have broken my hand! Play heavy only 5 days per week. One optional light poker day. One required poker-free day that includes getting outside. Take ME time frequently during the day. I take all my meals in a quiet place where I simply focus on the meal. At the end of the day, I make it a point to leave any activity that might stress me and do something that I find enjoyable, like reading or TV. I tried putting video games into this slot, but they don’t seem to help. Limit all stress-causing activities to an hour and a half or less. This one seems too obvious and yet, playing long sessions of poker is likely the #1 cause for getting me into the long-term stressful life that caused me to slam my hand into my chair. This goes not just for poker but for anything that I find stressful. Exercise. It doesn’t take much in the way of exercise to combat stress. The best and most enjoyable kind of exercise is getting out to a park and walking or any activity that gets you outside. I personally find the whole gym membership thing to be stressful in itself so I skip it, your experience might be different if you enjoy being around people. Non-stress causing vacations. I’m lucky in that I live in Las Vegas. There are a great many places to travel to for short or longer trips. Zion, Yosemite, Lake Tahoe, Mexico, Grand Canyon. Find a place to go and reset yourself.